Like other members of the mollusk family, snails lay eggs that eventually hatch to release live young. With such reproduction, most of the gestation process takes place within the eggs over several weeks time. During that time and immediately after hatching, the baby snail goes through several stages of development. Most snail species are hermaphrodites -- they possess the reproductive organs of both the male and the female. Technically, these snails can reproduce on their own, but most choose to find a mate and reproduce sexually. A 2009 study found that sexual reproduction produced fewer harmful mutations in the snails’ genes than did asexual reproduction. To mate, one snail rubs the foot -- the portion of the snail body responsible for movement -- against another snail's foot to exchange sperm. After the mating ends, both of the snails will typically have fertilized eggs and will bury them. 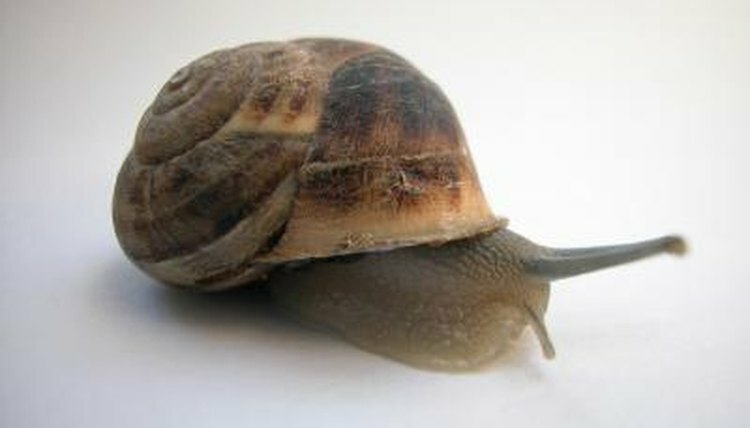 After snails bury their eggs, the so-called gestation process usually does not take long. Some snails begin hatching in as little as 24 hours; some don't hatch for up to four weeks. In the wild, the average gestation period lasts between two and four weeks. What happens inside the shell during this time varies according to environment and according to snail species. For example, Japanese snail larvae inside the egg begin moving only after the tenth day, while Calliostoma ligatum snails have already hatched by the fourth day and seem to be moving within the egg on the second day. Snail larvae develop initially through a process known as spiral holoblastic cleavage. Cleavage refers to the initial cell divisions of the fertilized worms, which create the cells that will continue dividing and specializing to create the larvae. In mollusks and a few other animal groups, this division results in a spiral shape with the groups of divided cells touching each other and forming distinctive patterns. When they are ready to leave the eggs, the larvae begin tapping on the inside of the shells to eventually weaken them enough to permit breakage. In many species, the first snails to hatchstay in the nest and consume the eggs of their siblings. Even after hatching, most snails stay close to their birth location to the next for up to three months, with their parent continuing to provide protection. Interestingly, snail larvae are born with shells that will grow as they mature. However, the nepionic whorls or markings on the shells at their hatching are usually distinctive, allowing for species identification. UCSB Science Line: How Do Snails Reproduce? What Kinds of Birds Eat Snails?